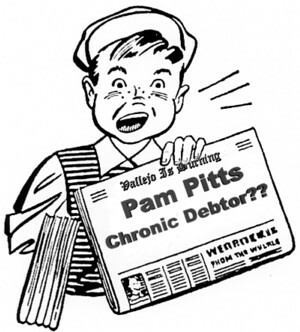 It seems Pam Pitts has been delinquent on her mortgage and is attempting to use her children to obscure a bad debt. 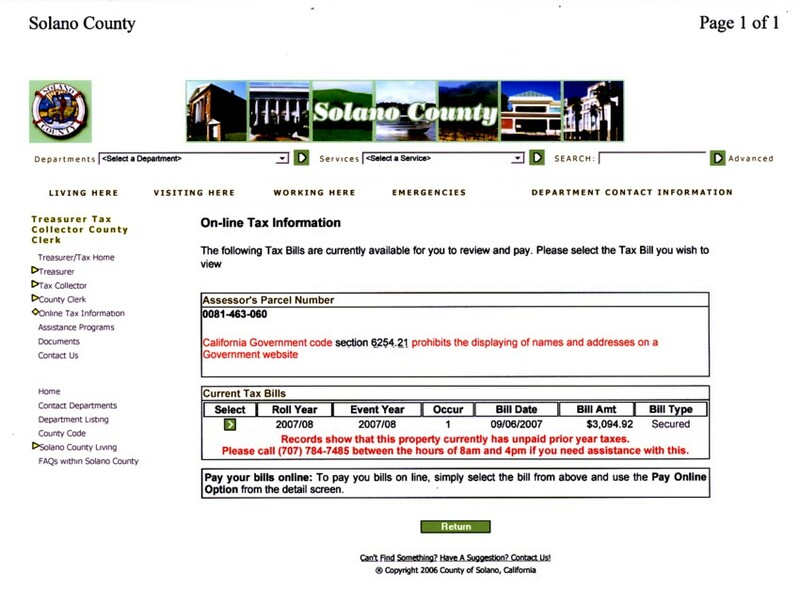 The Solano County web site does not display the amount of the delinquent taxes, It states "Records show that this property currently has unpaid prior year taxes." So we called the Solano County Tax Collector and they were able to confirm that the parcel number above is for 480 Goheen Circle, Pam's address as listed on her FPPC report. It seems that this property was transferred (without any exchange of money) to her daughter's name on December 6, 2004. Just short of 5 months after Pam's second mortgage default. Coincidence? We think not. Pam still lists this as her place of residence. Clearly, this is an attempt to obscure a bad debt. The tax collector's office was also able to tell us that taxes from 2005 and 2006 are unpaid. The total amount due, including the current taxes pending, is $7256.80 as of November 1, 2007. We were also able to find an unpaid garbage bill, which has been attached to the tax debt in the amount of $78.98 (twice). And, Pam's daughter is also listed as her assistant campaign treasurer??...Hmmm? This all seems a bit disconcerting when you consider Pam's claim that she is the "CEO of a multi-million dollar Vallejo-based Technology and Technical staffing company" as stated on her website. According to the expensive flyers Pam is sending (and the unions are paying for) to all Vallejoans, she "will get Vallejo headed in the right direction". Consider the fact that Michael Wilson, Erin Hannigan and the fire union are advertising with her and think she is the best candidate for mayor. How can anyone support a candidate for mayor or council who can't or won't take care of their own responsibilities? If we support Pitts, Wilson and Hannigan, we are saying that they can do whatever they want while we pay the bills. Is this the right leadership for Vallejo? Is this what "will get Vallejo headed in the right direction"?